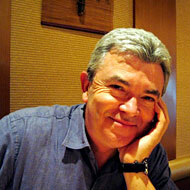 David Mundy (RSHom, FSHom) qualified in Acupuncture at The College of Oriental Medicine, then trained in Osteopathy. “In 1975 I discovered homeopathy and realised that this was my true passion.” He studied at the College of Homoeopathy, Regents Park, London, and continues to teach at The School of Homeopathy in Stroud, UK. In 1993 David Mundy was awarded a Fellowship of the Society of Homoeopaths for services to homoeopathic education. He has had two articles published in The Homoeopath journal, and is writing a book on homoeopathic philosophy and practice. David Mundy has taught homeopathic philosophy and materia medica for many colleges in UK, and internationally, regularly returning to teach and research in Japan, since the disaster at the nuclear reactor. David Mundy has a practice in London and Devon, England.